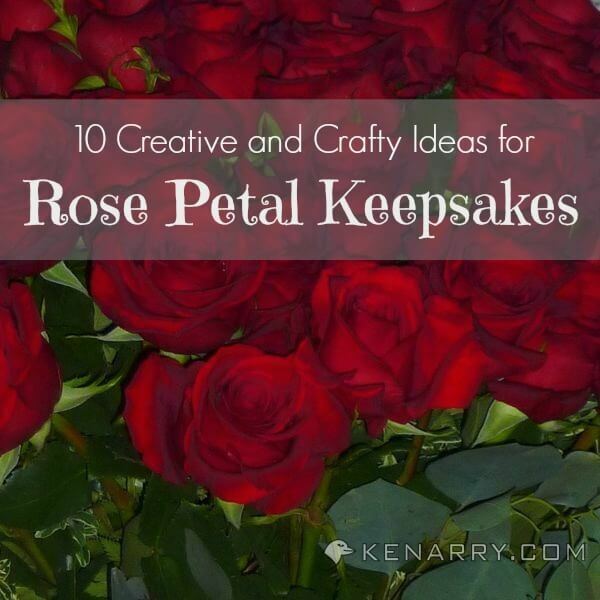 You’ll love this round up of 10 ideas to create rose petal crafts, keepsakes, and gifts using flowers from Valentine’s Day, weddings and more. Wondering what to do with that bouquet of wilting roses? You’ll love this round up of 10 ideas to create rose petal crafts, keepsakes, and gifts using sentimental flowers from Valentine’s Day, weddings and more. Welcome to “Ask Kenarry,” a new feature on our blog, where our friends, fans and followers ask us to gather ideas for their home. The question most recently posed to us was “What crafty, creative ideas do you have to preserve, reuse or display roses after they have passed their prime?” We initially threw out the question to our followers on social media and then gathered additional ideas through our own searches on Pinterest and the Internet. We hope you’ll love the ideas we found for rose petal crafts, keepsakes and gifts as much as we do. ASK KENARRY QUESTION: What crafty, creative ideas do you have to preserve, reuse or display roses after they have passed their prime? Our question this month comes to us from my mother-in-law. 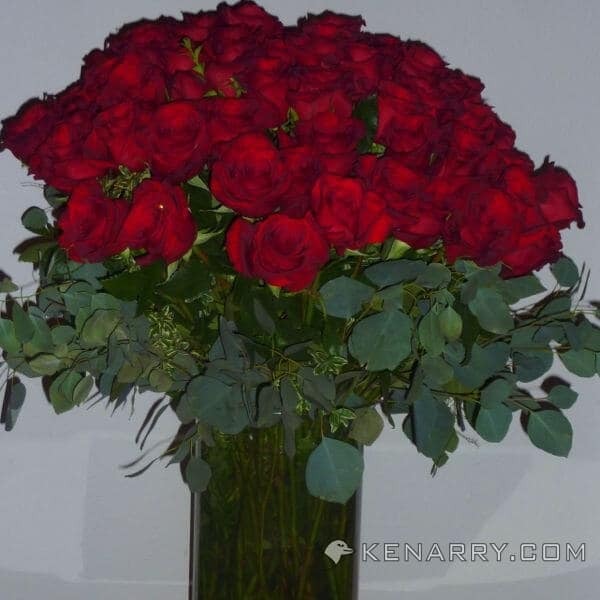 On her birthday in December, she received a stunning arrangement of long-stemmed red roses, one rose for every year of her life. Let’s just say there were a “significant” number of roses in that bouquet as this was a milestone year for my mother-in-law. I was admiring her beautiful flowers while we were visiting over the holidays, so she and I started to talk about what she could do with the flowers after they started to wilt. 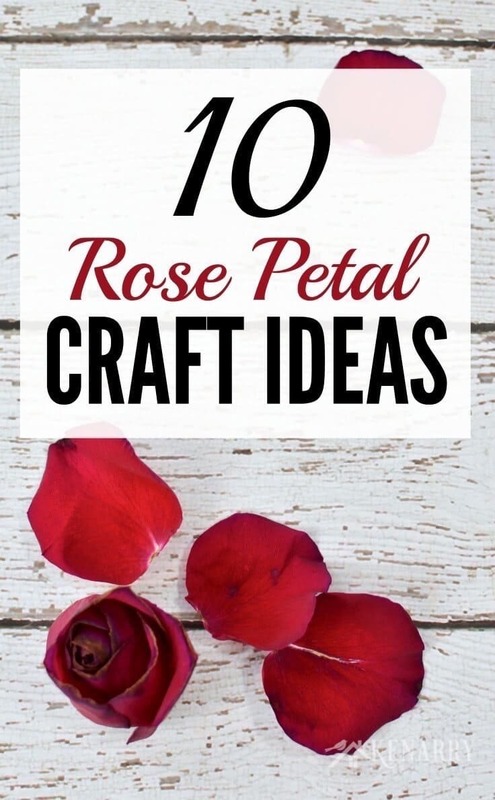 The only two ideas for rose petal crafts that we could come up with were drying the rose petals to make into potpourri or simply putting them in a glass vase of some sort to keep on a shelf. We knew there had to be other clever ways to use them for rose petal crafts or to create special keepsakes so she could enjoy them longer. Our search turned up 10 excellent ideas for her. Here are the 10 craft ideas that use rose petals, as shared by you – our readers and followers. Some of them are so incredibly creative, we are thrilled to share them with you. When we threw out the question to our friends and followers on social media, Diana from Ontario was one of the first to respond. 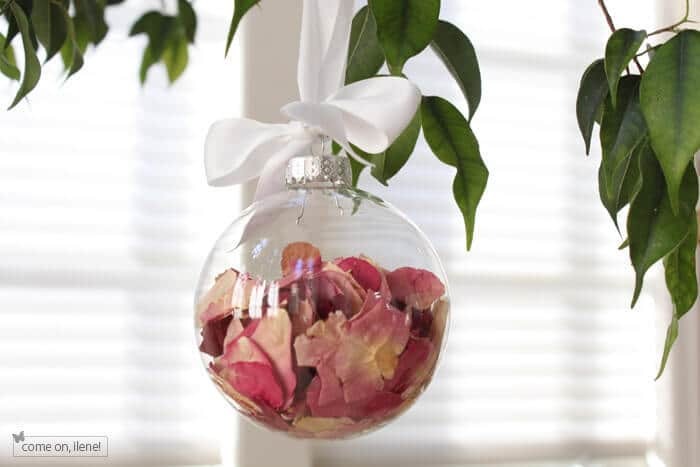 She suggested the dried rose petals be put into a clear glass Christmas ornament. Then each year when my mother-in-law hangs the ornament on her Christmas tree she’ll remember her special birthday gift. Pat from South Carolina, another friend and follower on Facebook, suggested that my mother-in-law put dried roses in a shadow box. My mother-in-law is a paper craft enthusiast. 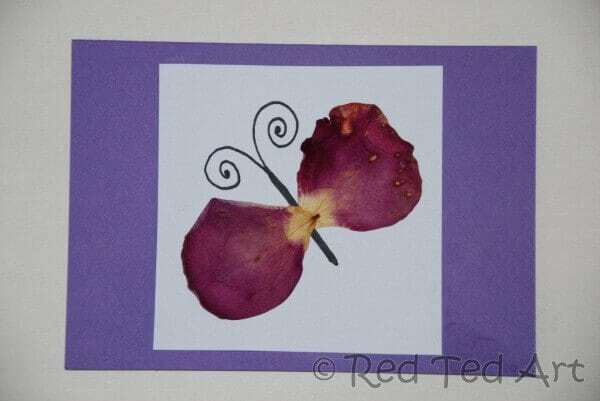 Some of her favorite crafts to make are greeting cards, so I was excited to find this rose petal craft idea for her from Maggy at Red Ted Art. 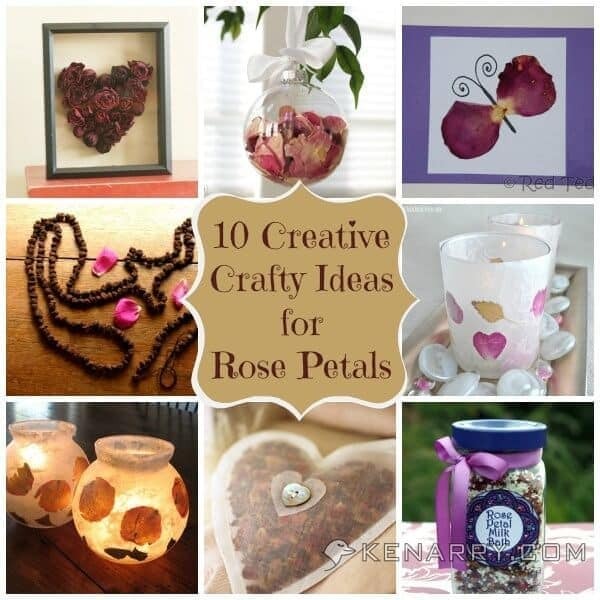 Wow, what a fabulous round up of projects to do using rose petals. I am really inspired to try these! Thanks for adding my rose petal bath fizzies to this awesome group! What fun this will be! Hi Anna, thank you again for letting us share your idea for the rose petal bath fizzies! Glad you enjoyed the other ideas too. Thanks so much for including my votives! Thank YOU, Amanda! We appreciate your willingness to let us share the idea. Darlene, Thanks for visiting — and pinning! Great collection of ideas. Pinning to my DIY board. Stopping by from Pin It Party. Thanks for stopping by, Shirley! I’m so glad these ideas will be on your DIY board on Pinterest. You are so welcome. Thank YOU for following us on Bloglovin! Love the ornament idea! Thanks for stopping by over at The Redheaded Princess! And what great ideas!! Isn’t that a fun one! I always enjoy ornaments with special meaning as they bring back memories each year when you hang them on the tree. Thanks for swinging by Kenarry to take a look, Jessica. We’re thrilled! Thank you so much, Daniela! And I just got roses for early Valentines! I was stopping by to say hi from linkin blogs party…so Hello! Aren’t early Valentine roses fun? My husband and boys gave me roses last weekend so I’ve been able to enjoy them all week. Hope you find some great ideas here to turn them into a special keepsake or gift a few weeks from now when they’ve started to wilt. These are all such great ideas and all so very different. In my family it has been a tradition to press flowers and keep them in the family Bible but I love these beautiful displays. 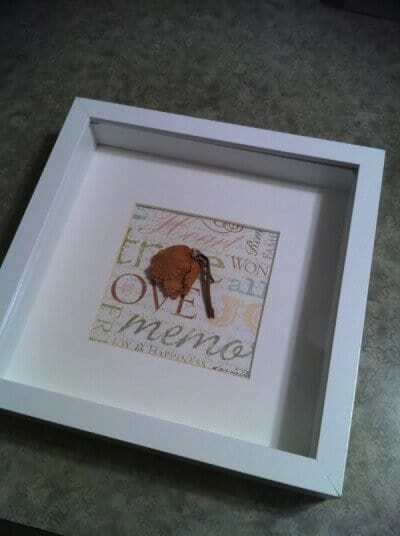 My favorite is the dried roses forming a heart in the shadow box…very creative. This was a great Ask Kenarry! 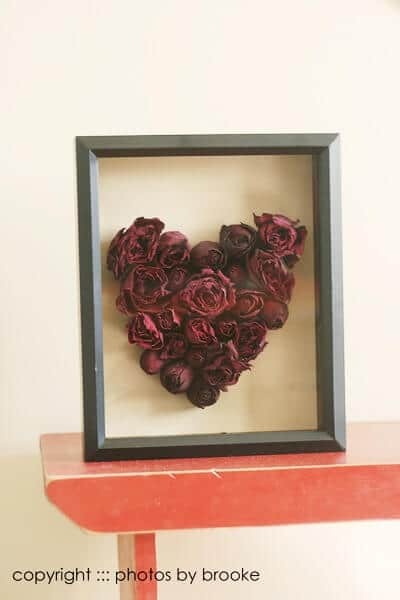 I love the creativity of the red roses and the heart shape in that shadow box too. What a beautiful tradition to keep your flowers in the family Bible. Thanks for sharing!